Basketball scouting and basketball analytics don’t need to be oil and water. They tell you different things, but they’re not entirely different. They can be used to supplement one another because they are pieces of the same puzzle. I’ve previously written about how basketball organizations can make the most of their scouting and analytics departments with limited tension. It starts with the decision maker (usually the general manager) ensuring that the scouting and analytics departments are both heard during decision making processes. The organization needs infrastructure that provides the decision maker with easy access to all forms of information. If your organization has the above aspects in place, it will be easier for everyone – scouts and analysts alike – to communicate and work together. That’s how a good organization does it. But you don’t have to be a billion-dollar organization to take advantage of this model for success. As a single person looking to utilize both scouting and analytics in your work, you can make yourself into a miniature organization that follows this model. You need to start by understanding it doesn’t have to be a competition between scouting and analytics. Maybe you’re trying to evaluate a player, a team, or a strategy. Regardless of what it is exactly, at the core, you start by asking a question. Then you try to find an answer to this question. If you want to get a good answer, you won’t limit yourself to just one tool, scouting or analytics. To understand how they can work together, you have to keep in mind what basketball analytics really means. Analytics isn’t about numbers alone. 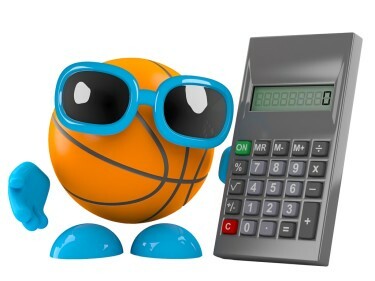 Good basketball analytics is about asking the right questions and using all the information you can get – including information gathered by traditional basketball scouting techniques. When evaluating players or strategies, you’re often trying to make a prediction. Anthony Davis will be a superstar power forward. Championship teams in the near future will all have a lot of three-point shooting. This undrafted guard prospect will be a solid backup point guard someday. To make good predictions, you must have a mindset that appreciates the uncertainty in the process. You need to think probabilistically. There’s not always a right or wrong answer. Your answer won’t be some sort of sacred fundamental truth. You’re usually painting with shades of gray here. This is basketball. The future isn’t set in stone. Things will happen that you can’t foresee. Don’t try to figure it all out in five minutes. It’s about gathering information that helps you move the needle in one direction or another. You usually want to move the needle a little bit at a time. A forecaster who doesn’t adjust his or her views in light of new information won’t capture the value of that information, while a forecaster who is so impressed by the new information that he bases his forecast entirely on it will lose the value of the old information that underpinned his prior forecast. But the forecaster who carefully balances old and new captures the value in both – and puts it into her new forecast. The best way to do that is by updating often but bit by bit. The best predictions involve gathering new information and using it to make small adjustments to your current line of thinking. To give a basketball example, I talked recently with a mentor of mine who is an NBA executive. He spoke about how susceptible fans, the media, and even other teams are to overvaluing March performance when evaluating college basketball prospects. One or two good (or bad) performances in March can weigh in the minds of people as much as 20 or 30 other games – which is silly. It’s classic recency bias. Studies also shown the March Effect to be true. March matters, but not more than the rest of a player’s body of work. It’s better to adjust your prediction little by little. Basketball analytics is about asking the right questions. It’s important to note that asking questions and finding answers are separate processes best done in order. While it can be tempting to immediately jump to a conclusion upon learning something new, it’s not going to get you good results in the long run. Rather, it’s about asking a question and then moving the needle one way or another. 1. Any type of tool can be used to ask a new question. Basketball people are most familiar with scouting as the traditional way to ask new questions. I saw this freshman at Kentucky. He looks like a great prospect. How high should he be on our board right now? In some organizations, the analytics department is a tool used only for answering questions posed by the traditional basketball people. They don’t get to ask the basketball people questions. “Basketball people” can use these tools, too. In Chasing Perfection — a book you should purchase if this subject interests you — Andy Glockner describes how Colorado State became one of the four schools in 2014-2015 men’s college basketball to install the SportVU technology in their arena. Video coordinator Willie Glover, in charge of interpreting the SportVU data, looked for ways to convey useful information. While a lot of what Glover sent along [to head coach Larry Eustachy] was fairly rudimentary, there were sometimes pieces of information that he flagged that would allow the team to more closely consider how it was deploying some of its personnel. One such thing Glover suggested was looking at the number of touches per game the team’s main ball-handlers were getting, and seeing how many assists per touch they were generating. The information Glover presented his head coach raised important questions about how their team’s offense could become more efficient by emphasizing the best distributors. You can do this process on your own, so long as you realize your starting information is a question, not an answer. There are some questions that are best raised with traditional scouting, especially when there is a lack of reliable statistical information. If there’s an athletic seven-footer sitting on a powerhouse’s bench, statistics will probably miss him. Other questions can be identified more easily with statistics. For example, you might look for players who are statistical outliers. Hey, this guy at Weber State has the second-highest player efficiency rating in the NCAA. Could he be an NBA player? You could miss a Damian Lillard if you don’t look at the statistics. Even if you scouted a Weber State game in 2012 as part of your routine survey, you might have seen Lillard make only 4 of 17 shots against Cal. He would not have passed your eye test that game. That performance wouldn’t have led you to ask the question, “Could he be an NBA player?” You would most likely have just moved on. By thoughtfully deploying different tools, you maximize your chances of asking good questions. 2. It’s best to use a variety of tools to answer questions. You can use any type of tool – scouting, statistics, interviews, etc. Let’s say there’s a guard prospect you’re scouting. You’ve watched this 6’3” guard play several times. You love his scoring ability and destructiveness on defense. While many scouts have questions about whether he has the necessary decision-making and instincts to play point guard at the next level, you think he has what it takes. You think he’s an NBA point guard. Now, your tendency might be to look for other information to support your Point Guard Hypothesis. You want to be right! But remember, we’ve talked about confirmation bias before. It means seeing only what you want to see. That’s not good here – not if you want to get closer to a good answer. [Suppose you’re trying to predict whether the Dalai Lama will be granted a visa to visit South Africa.] If you’re constantly thinking the question is “Will he get his visa?” your mental playing field is tilted in one direction and you may unwittingly slide into confirmation bias … To check that tendency, turn the question on its head and ask, “Will the South African government deny the Dalai Lama?” That tiny wording change encourages you to lean in the opposite direction and look for reasons why it would deny the visa – a desire to not anger its biggest trading partner being a rather big one. Ask both sides of the question. A) Talk to people around the prospect. What do they think of him as a leader and decision-maker? How does he treat his teammates? Does he try to encourage them and make them feel included? When the Thunder were evaluating Russell Westbrook, analyst Ben Alamar broke down the field goal percentages of Westbrook’s UCLA teammates after receiving a pass from Westbrook versus other shots. In finding that Westbrook’s passing had a positive impact on his teammates’ scoring success, Alamar learned information that moved the needle toward Westbrook being a capable NBA point guard. D) See what past events tell you. This occasion isn’t the first time anyone has asked this question of a similar player. Try to take something away from what’s happened before. This technique is taking what the authors of Superforecasting call “the outside view” (or what statisticians call the base rate). Instead of looking only at the specifics of this individual player (“the inside view”), look at how common something is in a broad sense. If you discover that 95% of promising guard prospects who are considered tweeners end up not becoming successful NBA point guards, it provides you with valuable information that moves the needle. None of those methods will answer such a complex question on their own. Taken together, they give you a backpack of valuable information that moves you closer to an answer you can act on. Basketball scouts can benefit from analytics. Using both schools of thought helps you ask good questions and answer them well. Even more than that, practicing both helps you do your job better. It allows you to better understand people with different perspectives and communicate with them more easily. It helps you refine your thinking. You figure out how to ask good questions, an important skill in every area of life. You become better at distinguishing between the information that matters and the information that doesn’t. That saves you time and energy, too. It helps you experience more peace of mind and happiness in your work. Instead of seeing opposition – scouts vs. analysts – you see different skill sets working toward a common goal. Scouting and analytics emphasize different skills but a lot of overlap exists. I come from a computer science background. I see a lot of ways in which the analytical method of thinking I learned from that area has translated to make me a better scout. It helps me see how the details fit into the big picture. It encourages me to ask better questions. Scouting helps me notice details I might have missed before. It’s encouraged me to focus and concentrate better. And yes – it encourages me to ask better questions, too. That’s all for right now. Here are the two things I suggest you do next. Put in your info below this article where it says Free Scouting Guide to sign up for HoopsThink updates via email. You get a free copy of The Basketball Scout’s Cheat Sheet: The 4 Pillars of Effective Scouting. It’s a scouting guide I wrote that’s filled with tips and next steps for you. Read through the rest of my curated basketball scouting content here on HoopsThink. I put in a lot of time and energy to create basketball scouting content that can help. Take advantage of it! Enter your name and email address to receive a free copy of The Basketball Scout’s Cheat Sheet: The 4 Pillars of Effective Scouting. James Kerti is a basketball scout and consultant who has provided a number of college and NBA teams with strategic advice and recommendations since 2012.